On the surface, Moonlight presents three formative episodes in the life of a gay black man, but taking such a bird’s eye view of the film misses all the details and nuances. Although Barry Jenkins’ film is indeed about the struggles and difficulties of a person embracing his culturally reviled sexuality, the story is universal in scope and intent. Moonlight is about poverty, intolerance, the battle to overcome seemingly insurmountable obstacles, and love. One doesn’t have to be gay or black or male to empathize with Chiron’s battles. Moonlight is essentially three short stories woven into a larger tapestry. Each features the same protagonist but at different times of his life: child, teenager, man. Certain supporting characters cross from one story to another; others do not. It’s like life. The people we know and are close to during one period might not be the same during another. It might be possible to watch each of Moonlight’s episodes as stand-alones but the movie gains impact by following the progression and depth of the character through all three segments. The whole is unquestionably more than the sum of its parts. The first episode, called “Little”, introduces us to Chiron (Alex Hibbert) as an elementary school child. Taciturn and withdrawn, Chiron strikes up an unlikely relationship with crack dealer Juan (Mahershala Ali) and his girlfriend, Teresa (Janelle Monae). With a parental void at home - Chiron’s father is nowhere to be found and his angry, distant mother, Paula (Naomie Harris), is better at punishing than showing affection - Chiron turns to Juan and Teresa as father/mother figures. He also finds some comfort in the friendship of Kevin (Jaden Piner), another schoolboy. By the time of the second episode, “Chiron”, things have changed for the protagonist (now played by Ashton Sanders), who is a teenage high schooler. Juan is dead, his mother is addicted to crack, and he is the object of relentless bullying. Kevin (Jharrel Jerome) remains his only friend and he still occasionally spends nights at Teresa’s to avoid being around his mother. Chiron questions his own sexuality and a passionate encounter with Kevin clarifies matters. Peer pressure, however, leads to a violent encounter in school that not only causes a break between Chiron and Kevin but releases demons lurking in the young man’s soul. By the time of “Black”, Chiron (Trevante Rhodes) has become a man - a hulking figure whose appearance belies his sensitive nature. He has moved to Atlanta from Miami and become a drug dealer, modeling his life after that of his first (and long-dead) mentor, Juan. The past summons Chiron, who now goes by the nickname of “Black”, back to his hometown. There, he has an emotional meeting with his mother and a lengthy reunion with Kevin (Andre Holland), who has turned his life around. Chiron admits his feelings to Kevin and Moonlight ends on a more hopeful note than the one on which it begins. In choosing Moonlight’s visual style, Jenkins has moved away from a recent trend to make “gritty” movies appear dark and desaturated. The colors are rich and vibrant and, although there is some hand-held work, the technique isn’t overused (nor are there an abundance of shaky-cam shots). Chris O’Falt’s piece in the October 26 issue of Indiewire discusses in detail some of the choices that were made to give each of the three segments an individual look. This was a conscious decision arrived at through a collaboration of Jenkins, cinematographer James Laxton, and colorist Alex Bickel. Moonlight boasts a true ensemble cast. Three talented actors share the main character’s role and the supporting parts are filled by experienced actors and newcomers, all of whom are good fits for their characters. There’s not a weak portrayal to be found and some of the performers who come with “baggage” (Mahershala Ali as Remy in House of Cards and Naomie Harris as Moneypenny in the Daniel Craig Bonds) are able to put aside those encumbrances. Equally important is that the three Chirons - Trevante Rhodes, Ashton Sanders, and Alex Hibbert - blend seamlessly so we never doubt we’re watching the same character at different ages. 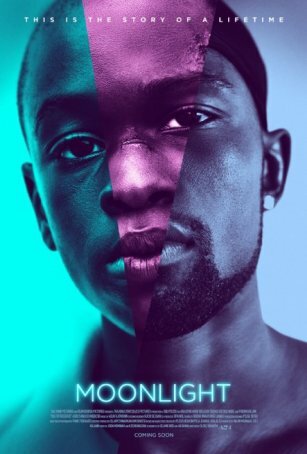 Emotionally and thematically, Moonlight addresses universal subjects: bullying, coming to grips with one’s sexual identity, and navigating the treacherous waters of adolescence to emerge into adulthood. The specifics of Chiron’s environment and culture may be foreign but Jenkins identifies touchstones that are common across races, genders, and socio-economic strata. The use of three episodes develops Chiron in ways that a more traditional screenplay might not be able to do. If the story’s trajectory seems familiar, that’s because Moonlight is grounded in real, common occurrences. Its power comes not through surprising and unexpected narrative developments but as a result of our identification with the characters. That’s a rare and welcome thing for a movie to achieve.